I always used to be terrified of yellow and black insects that buzzed and had a sting. Growing up in England, wasps were a constant menace in the summer invading picnics, walks, sunbathing sessions or flying through an open window and buzzing angrily around the house. I still have vivid memories of unlocking the door to a hotel room in France and finding three hornets (and they can really sting, and multiple times) flying around. Even after the concierge had dispatched them to the next life with several applications of spray, I felt compelled to check there weren’t more of them hiding under the bed, under the pillow, in the cupboard or down the loo. And on holiday in France in 2003, there was a swarm of wild bees in the attic above my room. Although it was unlikely they would drop through the beams and descend on me in the night, I found it hard to relax with the intense humming-kind of sound going on above me. It was all a bit too reminiscent of one of Roald Dahl’s Tales of Unexpected. I’ve got much less hysterical about wasps which is just as well as I get as many in my Melbourne garden as I did in London or Oxford. 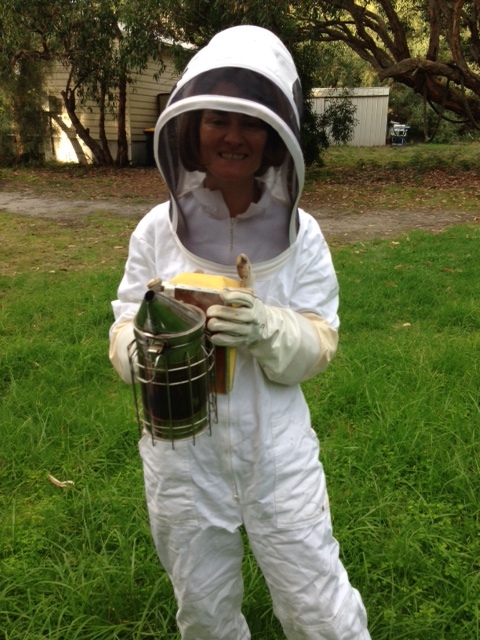 And I’ve recently learnt a lot about bees and developed a great respect for these magnificent creatures – thanks to my friends Felicity and Marc in Anglesea. Felicity is a writer and illustrator and she is currently working on a marvellous children’s book, Bye Bye Honey Bee. Check out her website at http://www.felicitymarshall.com. Before I visited the hive for the first time back in May, I underwent an induction into the world of all things bee-related. Incidentally, there isn’t an adjective that describes or relates to bees. There’s apiary meaning a collection of beehives or apiarist meaning a beekeeper but no handy world like apian to sit alongside feline (beeline being already taken), canine, leonine, avian etc. Anyway, back to the story. Felicity and Marc lent me two fabulous documentaries: Queen of the Sun by Taggart Siegel (the director of the Real Dirt on Farmer John) and More than Honey by Markus Imhoof. There’s so much to learn about bees and their role in food production and the health of our environment. Sadly, the bottom line is that bees are the canary in the coal mine when it comes to environmental Armageddon. But before I get too bogged in the problems of industrialised farming, let me take a minute to wow you with some amazing bee facts. Correctly stored, honey never goes off. Sealed honey vats found in Tutankhmun’s tomb were STILL edible despite being buried under the sand for over 2,000 years. Bees have to visit approximately 2 million flowers and fly 55,000 miles (approx 88,500 km) to make one pound of honey. Worker bees perform a waggle dance which is a figure-eight dance that indicates to other bees in the hive where and how far the best sources of nectar are. If I had to choose a favourite bee factoid it would be this one: it’s so clever, it’s like a ‘beeline’ GPS system. I was due to go back to my newly renovated house in Melbourne today and had been gearing up for a while, bracing myself even for the rigours of city life. But when I learnt that the painting was way behind schedule and that one of the shower screen panels and a pedestal basin had to be replaced, I was only too happy to postpone my return for another week. Well, what could I do? How would I manage the increasingly bumptious Bertie (all the beach romps and sea air are making him super fit and harder to tire out) around paint pots and wet surfaces? I was envisaging white paint on his paws and nose and chocolate brown hairs trapped in newly painted walls. So, I’m still here with the pounding of the ocean my bedtime lullaby, the chatter of birds my morning wake-up call and starlit skies unblemished by light pollution my night-time vista. And this week’s full moon sunsets have coloured the sky magnificent shades of purple and pink. Gaining an extra week here feels like precious time I have stolen back. 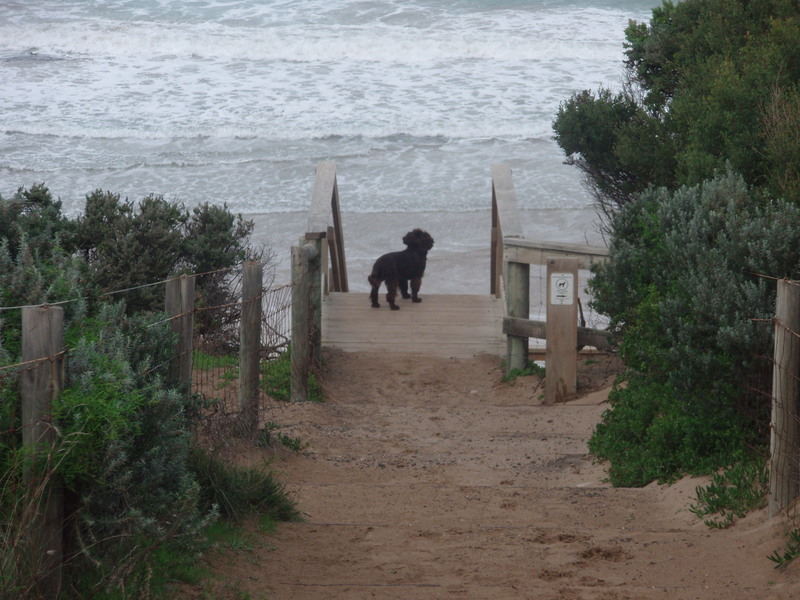 You see, I’ve rather fallen in love with life on the Surf Coast and haven’t really missed city life at all. Life is gentler here, quieter, slower and calmer and it feels GOOD. I’m not missing the traffic, the cacophony of caffeinated chatter and clattering of coffee cups in Melbourne’s many ‘go-to’ cafes, nor the one-upmanship and competitiveness about who is busiest or the most tired, the running around from thing to thing, the tail chasing and endless pursuit of the latest thing in retail, culture, sport, fashion or food. It’s easy to get trapped in wanting to keep up with it all and follow the crowd. Here my phone rings less, I write fewer lists, am less wakeful in the night and am more focused in my work. Some of the concrete-like tension in my neck and shoulders has softened, and I’ve become fitter, even running (well more or less) up the steep beach steps and doing mini jogs with Bertie. I’ve had moments of feeling like I did when I was a child; more carefree and in the moment without one eye constantly on tomorrow. There’s a more laidback vibe here what with all the surfer dudes, coastal dwellers and retirees, and things are less of a drama without the intensity of urban living. The other day, for example, I lost my internet connection and didn’t know why. I was working on a big project with a tight deadline but took it all in my stride. I drove up the hill to see if it was a signal problem (it wasn’t), so then rang my ISP provider and finally Telstra – whose 4G WI-FI device I am using here – only to find out I had run out of credit! It turns out that video calls on Skype gobble up lots of data. Lesson learned. Anyway, I lost about half a day but remained unperturbed, instead of going into a spin and wasting time and energy. Yes, I know, I’m being escapist and can’t run away from my other life forever. If I had moved here permanently, I would no doubt have regretted it by now, and felt I was missing out on the many advantages of city living. I’m talking as someone who has had a brief taste of country/coastal life and enjoyed it knowing my other life and everyone in it would still be there when I got back. But I think it goes deeper. I grew up in small rural villages in England or on the edge of small towns. Rolling green fields, country walks, dogs, tuning in to the seasons, peace and quiet were all part of my landscape – all low key stuff rather than the high-jinx and high-life. I think perhaps I’m a sociable loner who needs regular periods of solitude, preferably in nature, in between interacting with others. That’s why I so enjoyed reading Ailsa Piper’s account of walking the Camino (Sinning Across Spain) and her quest for solitude. Many fellow walkers wanted to be her friend and to barge in on her space. Ailsa was one of the writers at the recent Lighthouse Literary Fest in Fairhaven. She talked about the city as having no gaps and compared it to music in elevators; one of the many ways we block out silence. 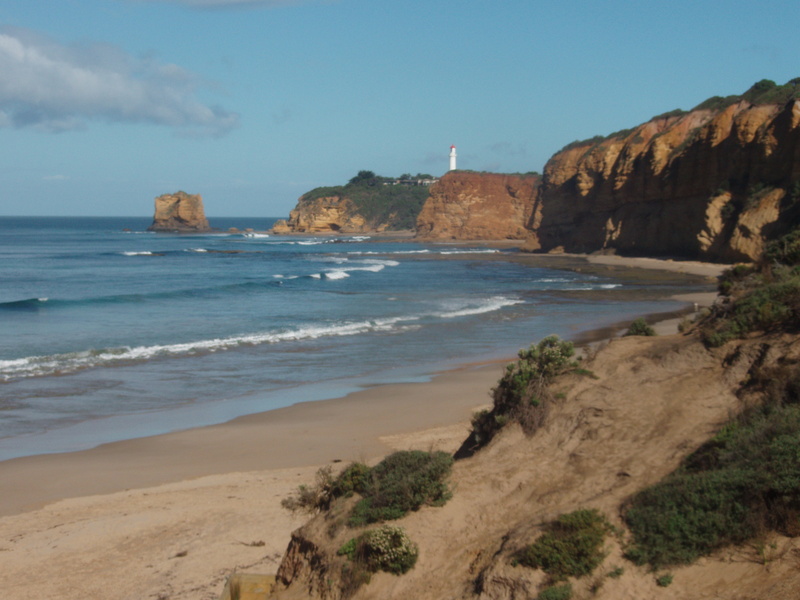 I’m going to luxuriate in the space, silence and serenity of my coastal surrounds this weekend. But, and here’s the social loner in action, there are a few excitements planned as well. A trip to Torquay tonight to see the local acting troupe in Twelve Angry Jurors, dinner with a writer and wine-maker tomorrow night and an opportunity to get up close and personal with a bee hive on Sunday.